Oh my god. This is perfect. 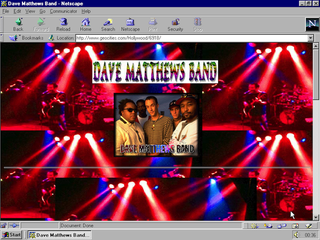 Because things on the Internet never really die and because old terrible things on the Internet eventually become wonderful and especially because Geocities was so hilariously awful, One Terabyte of Kilobyte Age is my new favorite website. It posts screenshots of old Geocities pages in all their blinging, blinking, clip art, galaxy background glory. I can't get enough of this. The One Terabyte of Kilobyte Age Tumblr is actually a part of Olia Lialina and Dragan Espenschied's research project about Geocities. The Tumblr just pumps out automatically generated Geocities pages from the entire Geocities archive that was made available a few years back (all 900GB of it). It's like staring at an alien corpse. If that alien corpse had a propensity for tiny images, horribly bright backgrounds and center justified text. What a horribly beautiful thing. God the Internet was so bad back then. Why the hell did we ever use it?